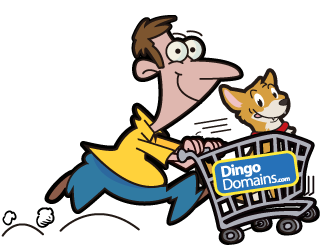 Although DingoDomains.com attempts to provide accurate, complete and up-to-date information, which has been obtained from sources that are considered reliable, DingoDomains.com makes no warranties or representations, express or implied, as to whether information provided on or via this web site is accurate, complete or up-to-date. DingoDomains.com does not represent or warrant that this web site functions without error or interruption. Where DingoDomains.com provides hypertext links to third party web sites, such links are not an endorsement by DingoDomains.com of any products or services provided on or via such web sites. The use of such links is entirely at your own risk and DingoDomains.com accepts no responsibility or liability for the content, use or availability of such web sites. DingoDomains.com has not verified the truth, accuracy, reasonableness, reliability, and completeness of any content of such web sites. DingoDomains.com, or the relevant owner, retains all rights (including copyrights, trademarks, patents as well as any other intellectual property right) in relation to all information provided on or via this web site (including all texts, graphics and logos). You may not copy, download, publish, distribute or reproduce any of the information contained on this web site in any form without the prior written consent of DingoDomains.com or the appropriate consent of the owner. However, you may print and/or download information contained on this web site for your own personal use. Links to DingoDomains.com web sites are not permitted without the prior written consent of DingoDomains.com. Messages that you send to DingoDomains.com by e-mail may not be secure. DingoDomains.com recommends that you do not send any confidential information to DingoDomains.com by e-mail. If you choose to send any messages to DingoDomains.com via e-mail, you accept the risk that they may be intercepted, misused and modified by a third party. Neither DingoDomains.com nor any of its agents or subcontractors shall be liable for any direct, indirect, special, incidental, consequential, punitive, or exemplary damages, including lost profits (even if DingoDomains.com is advised of the possibility thereof) arising in any way from, including but not limited to, (i) any defects, viruses and any other malfunctions caused to any equipment and other software in connection with access or use of this web site, (ii) the information provided on or via this web site, (iii) the interception, modification or misuse of information transmitted to DingoDomains.com or transmitted to you, (iv) the functioning or nonavailability of this web site, (v) the misuse of this web site, (vi) the loss of data, (vii) downloading or use of any software made available by this web site, or (viii) claims of third parties in connection with the use of this web site. The exclusion of liability is also made for the benefit of the CEO and employees of DingoDomains.com. DingoDomains.com reserves the right to change the information provided on or via this web site, including the terms of this Disclaimer, at any time and without notice. It is recommended that you review the information provided on or via this web site, including the terms of this Disclaimer, periodically for changes.